I'm satisfied, nothing to lose." One of the best things to happen to Saturday night is...JT's All-Request Show. Delicious Classic Rock from various eras...mostly 60's & 70's & 80's...but certainly not exclusively. JT's radio show is mainly controlled by the listeners...via call-ins and emails. With the majority requesting all-kinds of wonderful lost gems and deep cuts. You may recognize the rock artist playing...but be pleasantly surprised by the sometimes unfamiliar spin slammin' through your speakers. It's a rock fans treat. But let there be no doubt...it is Ol' JT that makes this 6 hour music party a winner. Maybe ...because he's a little bit different. He's down-to-earth. One of the guys. And real. A simple lover of RnR. None of the blowhardy wisecracken dime-a-dozen DJ's you mostly hear while flipping around the dial. No over-the-top buffoon laughter at under-developed jokes. And none of those DJ know-it-alls...who blow their rocknroll horns by reading some blurb out of a magazine or book and passing it off as their own stuff. JT is the 'Wolfman" of our era. He shares what he knows and is just as quick to learn from his loyal followers. 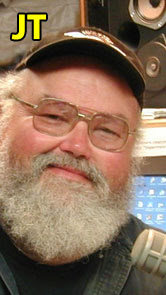 JT constantly allows his callers to be heard on the air. And one can't help but become familiar with the plethora of regulars who never fail to make his show more...entertaining. Interesting, for sure! JT is also heavily involved in our community with needy causes like...Biker's For Babies & Toys For Tots. And another necessary cause...ABATE of KS. (American Bikers Aimed Towards Education) a neutral organization that allows all riders to unite in a brotherhood to safeguard their rights. 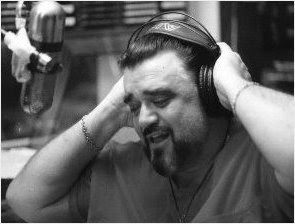 JT is the real-deal, my babies...and his 107.3 Saturday Night All-Request Show is as comfortable to enjoy as a well-used front porch glider. Climb on board the 'Deep Cut-Lost Gem' radio trolley. I've had my Kindle (e-book reader) for about 6 months now...and I still love it. You may see me with a paperback from time-to-time...but I'm totally spoiled by one (of many, many) features of my Kindle. I'm talking about the ability to instantly...seamlessly...look up a definition of any word I may come across without budging from my seat. It takes my Kindle about 4 seconds to help me out. That feature alone burns any physical book away. Check one out. Special props to all The Donut Whole folks. Those guys not only helped spread the word of my comedy show via walk-in customers and their website...but I was treated so very kindly by everyone. The turn out was fantastic and the crowd was definitely there for a good time. 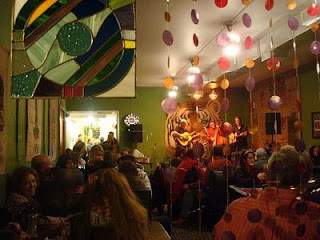 And...as I've said before...The Donut Whole is a wonderful venue to catch various performances. Bad Company started out being recognized as a...gulp...Supergroup. You had Mick Ralphs (Mott The Hoople). You had Boz Burrell (King Crimson). You had Simon Kirke (Free). And of course...Paul Rodgers (Free). Different influences coming to the table...but after the pot was stirred...Bad Company sounded like some very nice...juiced-up...new version of Free. Almost Southern Rock. Not a bad thing. I certainly dig their attitude. Here are ten of "my" favorite Bad Company songs that aren't heard that often. Early BC performing "Good Lovin' Gone Bad". Hopefully you'll seek these songs out and then investigate deeper into their catalog. ATTENTION: Bad Company...Please come to Wichita. To my father and my father's father. I love you. Have a Happy Father's Day everyone. I'm hitched up and ready to ride." Look for me at The Donut Whole...Wednesday...June 17th...around 8:30 pm. The Donut Whole was started by these two crazy cool cats (Michael Carmody and Angela Etter) who had a wicked dream of taking a simple idea and making it better. MUCH BETTER. Very very comfortable...with all the neat amenities of a coffee house. Killer aromas that tease the olfactories...fresh coffees brewing and delicious whack donuts fresh from the oven...keep patrons returning again and again. You'll feel welcome right away when you walk in...and being located amongst the Old Townsters...will also make for great people watching. Alone and with friends. A great hang place to gather or work...The Donut Whole has been marked, branded, and tattooed with that undefinable mark of coolness. They also have a nice area for various acts to perform. I hope you'll come out and throw a knuckle my direction...Wednesday June 17, 2009. 8:30 pm. 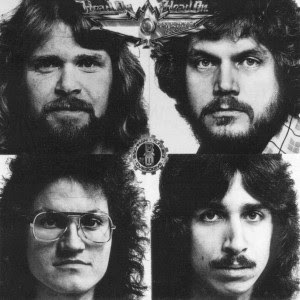 Bachman-Turner Overdrive (or BTO) makes the kind of music that's made for road trips. I get better gas mileage whenever a BTO song cranks from my radio. BTO also makes the kind of music that's made for just hanging around the house. Actually...it makes no diff. BTO music simply puts me in a better mood. Here are ten of "my" favorite BTO songs that aren't heard that often. BTO cranking another lost gem "Four Wheel Drive". ATTENTION: BTO...Please come to Wichita. Pink Nasty and me at legendary Kirby's. On Wednesday...June 10th...around 8:00 pm... I'll be doing a 40 minute comedy set at one of the definite hidden treasures in my fair city of Wichita. An awesome coffeehouse...with a huge variety of drinks and tasty munchables. So tucked away within the city is the Riverside Perk...that it has a time-traveling quality to the place. A wonderful hamlet to hang...relax...and convo. You'll dig it. And along with all the good vibes...yours truly gets to spin his web of comedy quirkiness. I encourage everyone to share the air with me that night. And an especial invite to my blogging comrades. Come on out June 10th. PN's new stuff is sounding very good. Check out Pink Nasty MySpace. 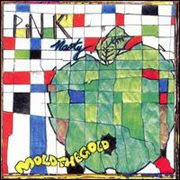 "Mold The Gold" is still one of my most spun CDs. And is my #1 favorite indie release. I've heard you dip your toe in Wichita from time to time. 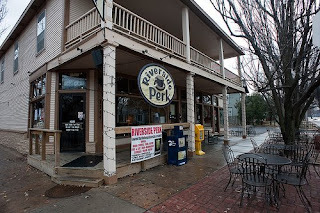 So consider this a personal invite for you to hang with me at...'The Perk'. And I know...you know...where that is.